Reel Talk Online: If I Say I Don't Hate 'Oz The Great And Powerful', Would You Revoke My Female Privileges? 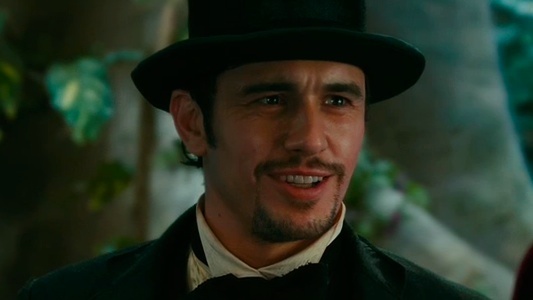 If I Say I Don't Hate 'Oz The Great And Powerful', Would You Revoke My Female Privileges? Remember that The Wizard of Oz prequel, OZ THE GREAT AND POWERFUL, that was released in theaters a few months ago and was subsequently lambasted by many feminist critics? I recently saw it on DVD and....I kinda liked it. Note, it's not one of those movies that rocked my world or even made me want to re-watch it. But I did enjoy the time I spent on it. It's gorgeously shot and the story moves fast enough for you to quite literally get swept up in it. But, from what I gather, folks were hypercritical about the concept of the somewhat doofy male character, Oz (James Franco), being the only one who could rescue a fairyland filled with female witches (of both the good and bad variety). That without him, they were nothing. That last bit is a slightly hyperbolic sentiment of an already fantastical premise. If you remember from the original film, Oz was always regarded as the savior of man(and creature)kind, the one who can heal them of straw brains and oil-less tin men. If anything, the character could be criticized as being too Christlike. But calling him a misogynist? That just seems unjustified. He certainly thinks he could seduce any woman with his crooked smile and makeshift hocus pocus, but he soon learns that it takes much more than that to gain even false respect. While Oz is regarded very highly, the women in the film are no shrinking violets. Rachel Weisz plays lawless vixen, Evanora, whose penchant for intimidation only matches her severe beauty. Her sister, Theodora (played by Mila Kunis), is also stunning in a role that is more compelling than meets the eye (plus, Kunis proves that her impressive Black Swan performance wasn't a fluke with this portrayal). Even Glinda the Good Witch (Michelle Williams), while at times disgustingly pure and precious, is not lacking in wits. Franco pretty much epitomizes the mystical oaf, and Glinda sees right through it and decides to still find something good within him. It's a family movie, like its inspiration. What more can you expect from it? What I got from the film is its idea of the gap between magic and our beliefs, what is truly good versus what is truly evil. Themes that are borrowed from the 1939 classic that are diluted but still present in this film. This isn't to say that OZ THE GREAT AND POWERFUL is on the same level as The Wizard of Oz, of course. But it is fascinating to compare how some of the same morals have been adapted for a new audience. This isn't the movie that I'd think would stir any souls or rile any rebel riots. Not one that has a green-faced witch and a talking monkey in it. But I do wonder if The Wizard of Oz came out today, for the first time ever, would audiences embrace it as much as they did over 70 years ago? I'm not so sure. It's no secret that films of yesteryear often depicted the unjust values we still fight to overcome today. So the idea of, say, a woman in an inferior position looking to a man for help or even validation didn't cause as much of an uprising as it would today. But in 2013? It becomes a real bra-burning moment. While a mediocre film in and of itself, OZ THE GREAT AND POWERFUL at least does a fair job interpreting its female characters. They are all stand alone interesting to watch, even if none are thoroughly developed. Ultimately, they are all wiser than the shady male protagonist, even when he thinks he's one-upped them (once they open their eyes, they all know better than than that). By the latter half of the film, they all come off capable and think for themselves, which is a lot more than some romantic comedies today can claim. But the title of the movie should suggest that it's really not about them anyway. It was about the rather elusive wizard who we knew little about in the original film. It illuminates his story, for better or worse. OZ THE GREAT AND POWERFUL is now on DVD and Blu-Ray. I'm a rare bird who loved this film, I really hadn't even thought about it being misogynistic. You make some great points about the female characters being strong females with strong wits. I forgot about this film already. I should throw it in my Netflix queue, I wouldn't mind giving it a watch. Great review. I really enjoyed this film and actually gets better with each viewing. Seen 3 times already! I think the problem I had with the movie was that the message is: Patriarchy is good, matriarchy is bad. Oz represented the stereotype that men are more logical, therefore smarter and women are illogical because they are ruled by their emotions. Kind of reminds of that joke that a woman could never be president because if she got a bad case of PMS she'd start bombing countries willy nilly. I think the sexism angle is overplayed, the real issue I had was that Franco didn't have the charisma to pull off the character.